The loud pattering noise the rain made when it hit the blinds woke me up. For a second, I imagined we could be in the middle of a storm, like the ones my friend N. and I used to experience when she and I still lived in New Zealand, in the small drafty wooden house tucked away at the end of Breaker Bay road. I stretched from toe to head and yawned before noticing it was actually still dark outside. My watch indicated 7:15 am; Autumn was definitely on its way and soon enough, it would actually be dark even by 8 am. I felt tired. I turned on my left side and made myself comfortable by propping my head onto a second pillow. I hoped I could still get a few hours sleep, but then I started thinking about the day and the plan I had made. So instead, I decided to get up. “It won’t be fun if it rains, will it?” I told my sister-in-law G. on the phone when I was done with a hearty breakfast made of fresh baguette, cheese, fruit and yogurt. She and I were planning to drive to Metz to do some shopping and eat at pâtisserie Fresson. I was hoping to taste the tartines they serve for lunch using Poilâne bread. The city could definitely wait. But nor Nature or my baking project could. 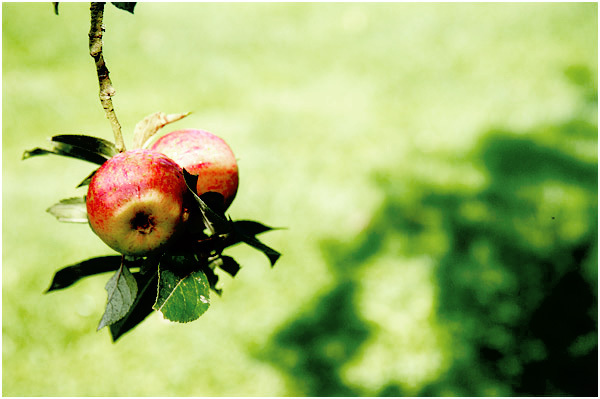 My brother has lovely apple trees in his garden. And so does his neighbor, and many other people in the village. 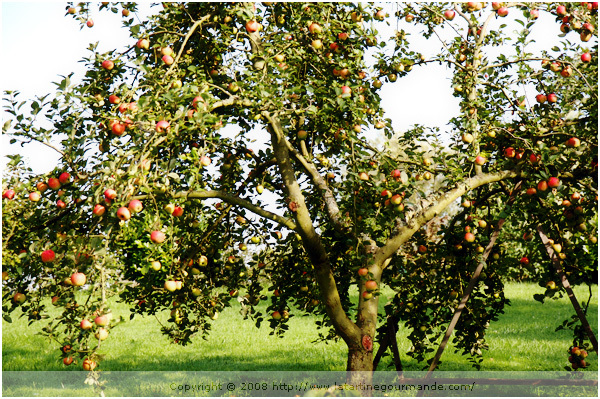 In fact, most people have apple trees around here. “I take that you will make apple juice again, won’t you?” I asked my brother B later. My parents had left for the day so I decided to cook a simple lunch with the vegetables from their garden. I stewed young carrots and zucchini with thyme and the organic virgin olive oil brought from Crete, and served this vegetable dish with sautéed rice and freshly chopped parsley. I was glad to have picked the vegetables the day before because the soil in the garden was quite wet, but then I thought about salad. I *needed to have a green salad with my meal. My dad’s Wellington boots were too big for my yet pretty long feet but they were just what I needed to complete my plan. They left deep footsteps in the water-filled soil but I did not care. I would come back crottée (dirty), that’s all. I picked the youngest salad I found, enough for two. Five minutes later, a freshly tossed green salad was placed on the dining table. Then I thought about the apples. Hence this was how instead of a tart, I baked an upside down apple cake. 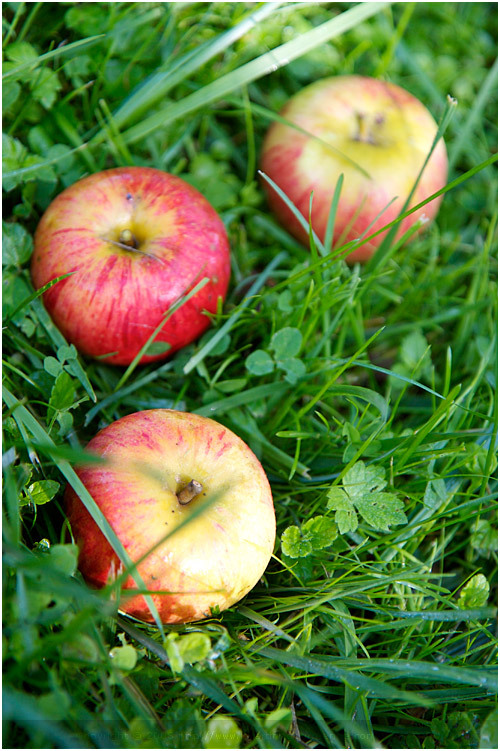 I walked to B. and G.’s garden to pick a few apples. There were fallen ones scattered under the trees, even if B. had cleaned the area the day before — they were going to make compote with them. I was planning to use the leftovers of quinoa and brown rice flours I had, and the fragrant olive oil brought from Crete, once more. I also thought of adding flavor with vanilla seeds and ground cinnamon, and crunchiness with roasted nuts . The cake was a success by all means. We sat down after dinner and savored a few slices with a pot of white tea while watching Un Gars et Une Fille on TV. We loved the airy texture of the cake, and the light yellow color provided by the the olive oil. 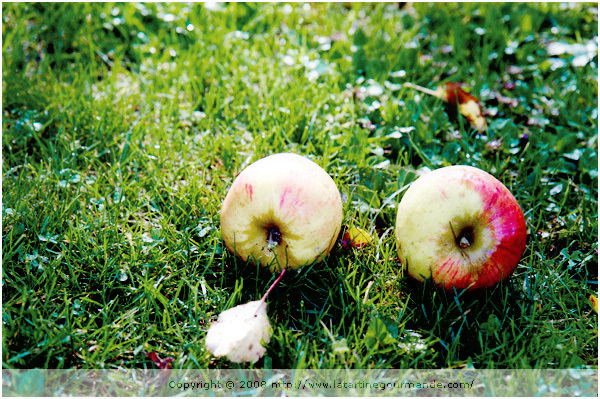 The apples were sweet and melted in the mouth, prompting us to eat more. And back in my mind, I was already looking forward to breakfast for another slice. I cooked them very simply, to make sure that we would enjoy the flavor of the fruit first. *Or replace these two flours with 1 cup all-purpose flour total. Preheat the oven at 350 F. Butter a round 9 inch mold — preferably non stick. Place the nuts on a baking sheet and roast them until fragrant (about 5 to 7 minutes). Remove and cool them; chop coarsely and set aside. Wash the apples and slice them finely (do not core them but remove the seeds). In a non-stick frying pan, heat 2 tablespoons butter on medium heat, and add the apple slices with the cinnamon and 2 tablespoons sugar. Toss well and cook for about 4 minutes, or until slightly tender. Arrange the apple slices at the bottom of the mold. In a large bowl, pour the yogurt with the sugar. Add the vanilla seeds, and mix well. Add the eggs, and then the olive oil. Finish with the flours, cornstarch, salt, baking powder, baking soda and nuts. Pour this batter over the apples and bake the cake for about 30 to 35 minutes, or until the blade of a knife inserted in the cake comes out dry. Let the cake cool and then unmold on a rack. Préchauffez le four à 180 C. Beurrez un moule à manqué de 24 cm — de préférence anti-adhésif. Mettez les noix sur une plaque de cuisson et faites-les dorer pendant 5 à 7 minutes. Retirez-les puis laissez-les refroidir avant de les concasser grossièrement; mettez de côté. Lavez les pommes et coupez-les en tranches fines (n’enlevez pas le centre mais seulement les pépins). Dans une poele anti-adhésive, faites fondre 25 g de beurre sur feu moyen, et ajoutez les tranches de pomme, 2 càs de sucre et la cannelle. Mélangez et cuisez pendant 4 minutes, ou jusqu’à ce que les pommes soient tendres. Arrangez les tranches de pomme au fond du moule. Dans un large bol, mélangez le yourt avec le sucre. Ajoutez les graines de vanille; mélangez. Ajoutez ensuite les oeufs puis l’huile d’olive pour obtenir une pâte homogène. Finissez par ajouter les farines, la poudre d’amandes, la maïzena, la poudre à lever, la bicarbonate de soude et les noix. Versez cette pâte sur les pommes et enfournez pendant environ 30 à 35 minutes. Laissez le gateau refroidir quelques minutes avant de le démouler sur une grille. Wow, your photos are gorgeous! The upside down cake looks so lovely, I bet it was delicious. beautiful, i lov ethis time of year. 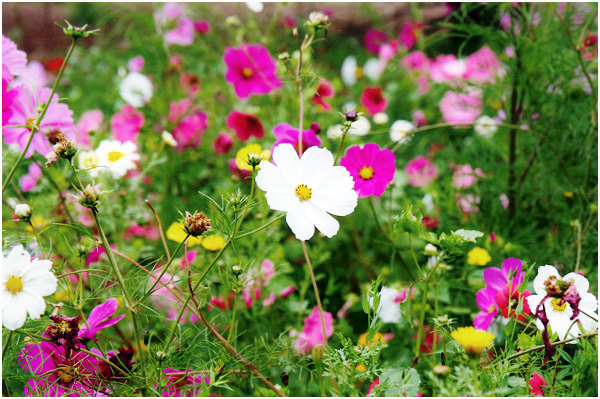 your photo are lovely! 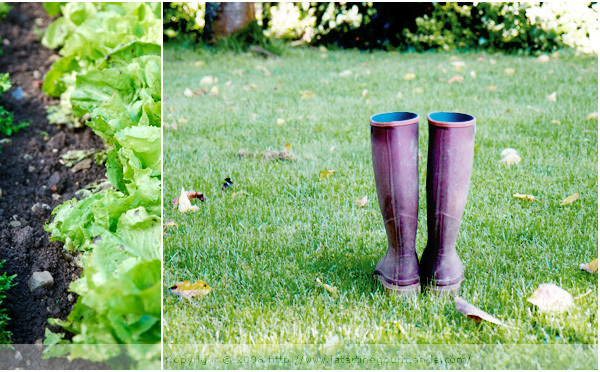 Wonderful photographs, I love your dad’s purple boot! Your recipe is very interesting, I never made apple tarte with olive oil before. I must try it one day. Mmm, looks yummy. 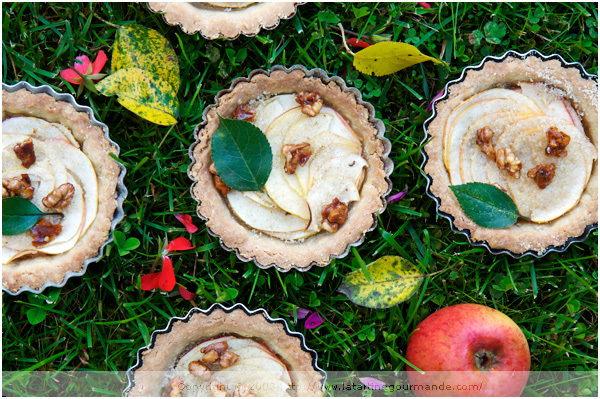 I have some apples growing in my garden and now I know what to do with them! Love your photos, especially the one of the boots! Your apple cake sounds delicious, maybe one day I will make it. What beautiful pictures! You really have the ability to capture the perfect moment! That cake and those tartlets look delicious! Wonderful! encore une belle histoire qui finit en recette delicieuse ! J’aime tes happy-ends ! So pretty! I love the apple slice with the little leaf on top of the cake. And the tartlets really do look like they fell from a tree! 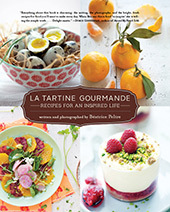 delicious words, images and inspiring! Bon séjour en France et porte toi bien ! Thank you for such beautiful and inspiring photos! I especially love the first one of the apple cake. oh my bea… it makes me want to buy a house in the country with a big apple tree and lots of flowers… bucolic, serene, full of light… gorgeous! Oh Béa, your apple cake is so pretty. I just bought a new mandoline. I can’t wait to try this recipe and my new kitchen gadget. It’s me again, Béa. Thanks so much for the links, Fresson and Poilâne. I love seeing what’s new in the big beautiful world of baking. Your photos are just beautiful!! I love going apple picking with my family and we indulge in them all fall. We usually go before Rosh Hashanah so that I can make an apple dish for the holiday. Oh Bea, your food styling is always the best! It all looks so lovely. Les premieres pommes, dans leur plus simple appareil, et les bottes de papa, trop grandes mais si confortables. Ca a du bon la campagne. Merci pour la version française !! J’adore tes recettes et je comprend l’anglais mais j’ai du mal à convertir les mesures. Cette fois-ci c’est “the top of the top” Thank you very mouch ! Ce gâteau aux parfums d’automne est magnifique et en plus, j’adore les pommes! Merci! my passion is gardening and i love all your pics, just a wonderful series, thank you! What magnificent views!! How lucky are you to have lived in such beautiful surroundings! Slicing the apples so thinly and lengthwise (if that the correct term) for the upside down cake is a very attractive touch. Makes the cake looks sophisticated – unlike my rather rustic ones! Aaah! The joys of the country! 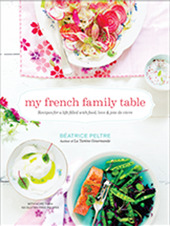 Where I live, having an apple tree or getting a young salad from the garden is just a blissful dream…thanks for giving me a peek into your family’s life in France! And that apple cake looks wonderful! Cool work here! It’s funny I passed by our neighbor yesterday and their “apple mango” has lots of fruits now. Ever taste and tried making a recipe out of it. I’m sure it taste differently from apples. oulala tes photos sont superbes!!! Both apple desserts look absolutely beautiful and would be a welcome new addition to my family’s Jewish new year dinner. i know how he feels! we have too many apples as well at the moment, and I can’t keep up! luckily, i have your recipes now, so won’t be stuck for new ideas! je retiens cette idée avec de l’huile d’olive. je suis dans ma phase huile d’olive en dessert. 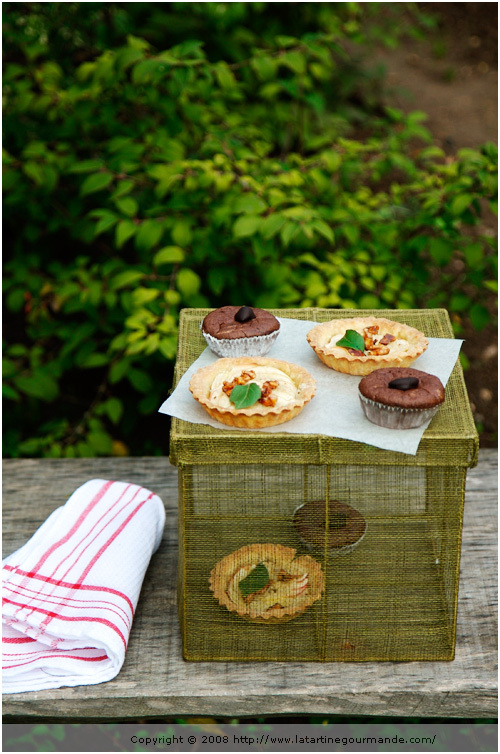 Love the cake and love the tartlets, can’t pick a favorite! They look so delicate, Bea! Oh my goodness, I can’t wait to make this! I’m headed home to my parents’ this weekend and am definitely making plans to stop by the local orchard to pick up some apples for this beautiful cake! Beautiful photos! I have been looking for an apple cake recipe and this sounds delicious. What a perfect post for the fall season. Looks amazing! And love the pictures…I think I’ll try this out sometime soon! J’ai déjà fait un gâteau semblable mais je meurs d’envie de faire le tien maintenant. Les photos sont magnifiques! c’est simple mais c’est bon ! Bea, this is such a magical cake! I just made it this afternoon and it looks just like your photos. The flavor is so subtle yet complex. Truly devine. Thanks for sharing it with us! 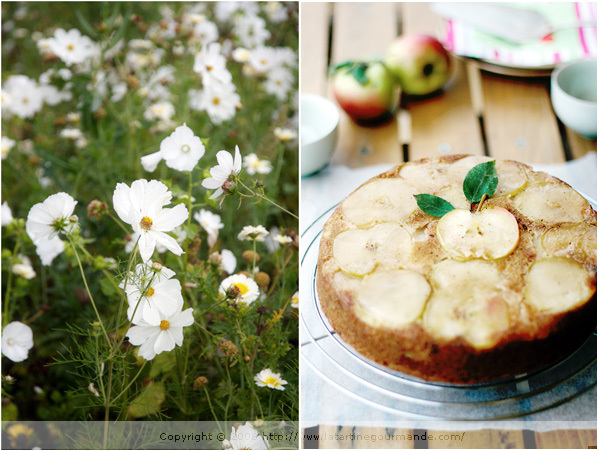 Thank you for your wonderful post on apples and cake. And congratulations on the arrival of your beautiful baby girl! I just wanted to let you know that I referred to this recipe in my newly created blog, where I baked an upside down apple cake with some guidance from your apple cake recipe. J’ai fait ton gâteau aux pommes cet après-midi, il était délicieux… quoique pas aussi joli que le tien… Merci pour la recette et l’idée de décoration avec les tranches de pommes ! 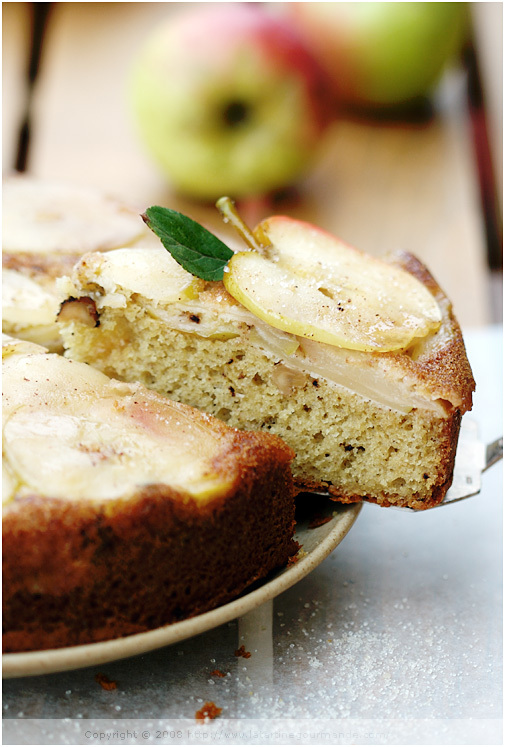 Hi Bea.i made your beautiful apple cake last week and it was so delicious! 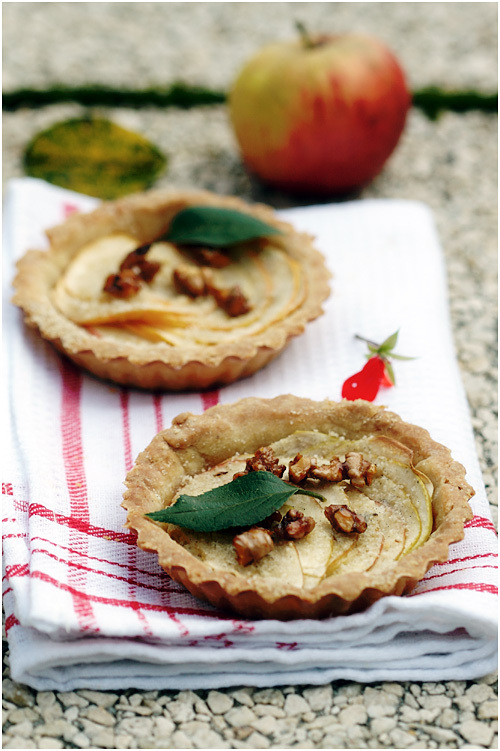 I am a coeliac and would absolutely love to have your recipe of the tart crust you made for those apple tartlets on the same post.Would you mind sharing it with us as well?the tartlets look just so tempting, i am obsessed with eating them!!thanks. J’adore ton Blog et y jette un coup d’oeil tous les jours! J’ai cuisiné (avec succès!) une bonne quinzaine de tes recettes déjà et celle-ci s’est avérée particulièrement savoureuse! J’ai réduit la qté d’huile d’olive a 60ml + 60g de purée de pomme et aussi ajouté 135g de zucchini rapé (pesé une fois bien essoré) à la recette. Le résultat était identique à ta photo, avec de jolies touches vertes provenant de la pelure du zucchini. J’ai apporté le gâteau au travail et tout le monde a adoré, surtout mes patrons! Superbe texture, et un goût qui plait à tous les palets. (même ceux qui n’aiment pas l’étiquette “gluten free”) It’s a keeper!! We, my parents, my granny and me, just finished enjoying your apple cake with vanilla ice cream and a cup of coffee. It was so delicious! Thank you for the inspiration you share with all of us.